Beer + Grapefruit Soda = Beer? 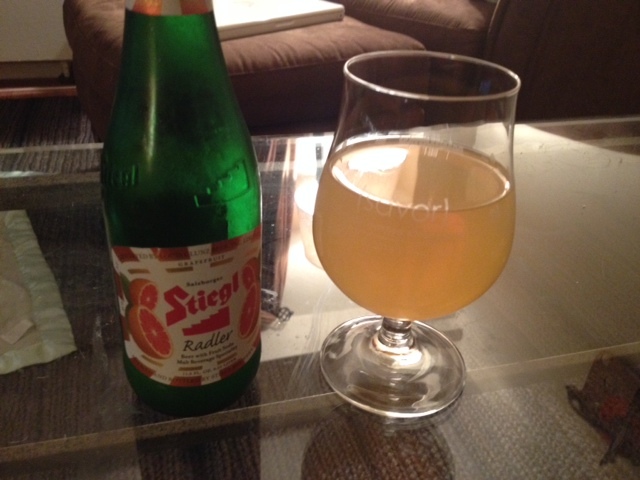 Eric: Apparently it’s pretty popular, but I just had my first Stiegl Radler (Grapefruit) today. They claim it’s half Stiegl Goldbrau, and half fruit soda. It tasted exactly like Grapefruit Pelligrino, which I love, but I have trouble considering this a beer. Especially at only 2.5%. If I drank 10 of these, I’d be more worried about the impending diabetes than my ability to operate heavy machinery like my JCB 3CX backhoe loader. They also make a lemon version. I don’t get the difference between this and stuff like Mike’s Hard Lemonade, or Zima (Andrew’s favorite). But if it tastes good, has a bit of alcohol, and will give you diabetes, it’s a win for the Brewboyz! I give it a rating of 68 out of a possible 84 grapefruits.